Once the program in final stages -will post it here,but there will be demos, displays,music ,clowns (for the young and old) ,food,raffles ,mini auction ,lots more- with time to reminisce about the good ole days !!!! If only objects could tell their story . 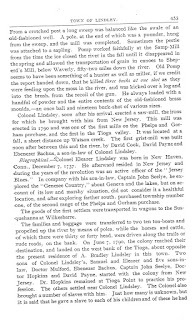 This is the tale of the millstone as I have heard it. There is speculation about how the millstone shown in the photos was used. 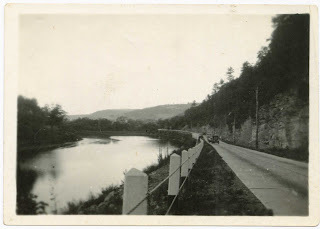 A number of years ago, it was located on the Tioga River Flats in Lindley near Steamtown Creek. It had apparently been washed up by a flood. Members of the Judson Kennedy family rescued it and had it on their lawn until they moved to California. Arlie and Katherine(Kennedy - a sister to Judson)Loughridge then became owners. After their death,the stone was in the possession of another member of the Loughridge family. In 2009, the millstone was placed in an auction.Fortunately, a former resident of Lindley recognized the stone and was able to purchase it. 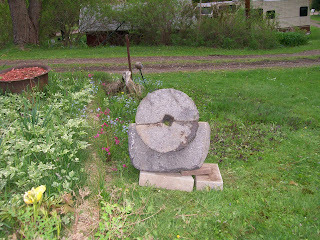 While not in it's original location,(as far as we know) the millstone found a home at a Steamtown Creek residence. Members of the Loughridge family report that their Grandmother remembered seeing the stone used to grind corn on Steamtown Creek. September 18th,2010 11AM to 4PM on the Presho Methodist Church Grounds. .
We will be meeting this Thursday August 19th at 7 P.M. at the Lindley Town Hall. Volunteers will be needed to make this a memorable day in the Town's history. 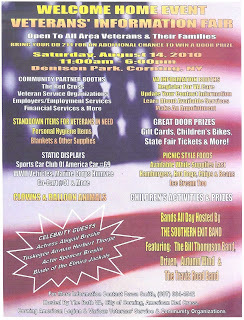 Mark your calendars for a day of reminiscing, eating , demonstrations, exhibits and just plain visiting with neighbors. The event will be hosted by the Lindley-Presho Historical Society with the help of the Presho Methodist Church @ Presho which is providing the space and their well known food. A meeting is being held August 19th ,2010 7 P.M. @ the Lindley Town Hall to finalize the planning. If you would like to assist in any way, shape or manner, please join us that evening. We are using the 1910 Old Home Days Postcard (pictured) as our theme. (100 years ago --WOW -how time flies !!!) Back then -they had 3 days of fun , but we are limiting the time to 11AM-4 PM. Hope to see all of you there .Watch here and the news media for more details as we complete them. Hopefully, the process of learning how to use a new scanner has been successful. Sounds like a wonderful way to salute those who have sacrificed to preserve our freedoms as we know them.